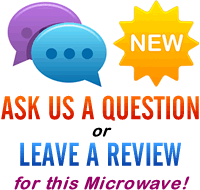 Looking to buy that perfect new solo microwave oven? Here we take a peek at the latest microwave from Russell Hobbs in the form of the new RHM2080BR. On the surface this appears to be a standard specification with a 20 litre 800w solo microwave, however on a closer look it features a distinctive black finish with red detailing which may well appeal to some. Looks good, works pretty well - quirky red and black colour scheme will no doubt appeal to some. No rubber feet - the main body can move slightly when opening the door. The Russell Hobbs RHM2080BR is an unusual red and black microwave, featuring a modest 20 litre capacity and 800w of power. 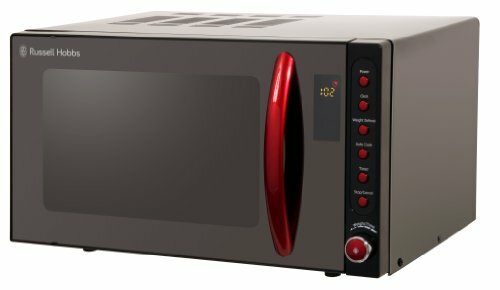 On paper this microwave is very similar to many others on the market, both from Russell Hobbs and other competing manufacturers, with the main selling point being a fairly unique red and black style finish which overall drew praise from our test team. It may not be to everyone's tastes, but in the flesh it looks smart, and will suit those amongst us who like gothic red and black colour schemes. The door features a mirrored finish, which looks smart, and overall build quality is pretty good. 5 different power levels are featured, as well as several standard auto cook menus and weight defrost settings. The clock and timing system are digital based, with an LED display, which is clear and easy to read. The turntable is glass, and measures 25.5cm in diameter - which should be big enough for most large dishes. The only slight criticism is that the microwave doesn't feature rubber feet, and so can move slightly when opening and closing the door - a minor issue. Overall we liked this Russell Hobbs microwave - it is a touch expensive for what it is, but it seems to work well. Overall the RHM2080BR is a high performing and good looking microwave - it is a touch on the small size at only 20 litres, but will be a reliable addition to the smaller household based upon past experiences with Russell Hobbs appliances.